I’ve written before about the increasing U.S. use of sport rather than the traditional sports. National Public Radio’s Frank Deford tends to alternate the two in his weekly commentaries. 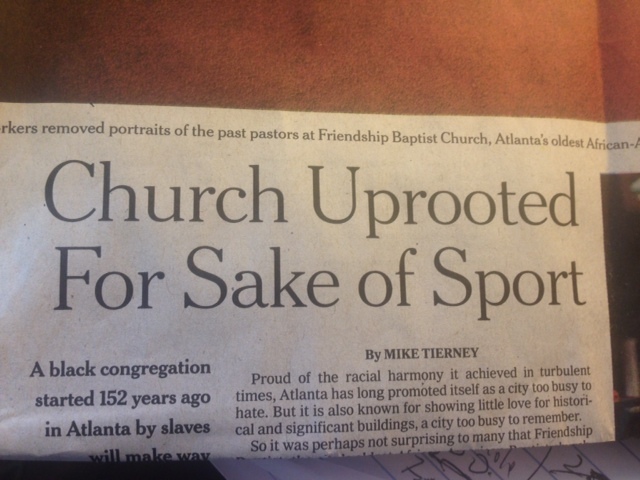 But this headline from today’s New York Times would appear to herald a new level of acceptance for the singular form. I’m really quite puzzled about this and I’m sure you are right about Sport and Sports. I called her to explain and she said she knew no-one her in England who used the singular. Her friends all use the plural. Surely this is just another case of communication across the world defeating those that would impose grammatical rules and spellings on the young?? I have an English friend who owns an Austin Healey. He calls it a Sports car. I’ve never heard them called Sport cars. I have heard Americans say Sport Boat., Sport coat., Am I going nuts? You’re right, in England we always say ‘sports cars’, mainly I guess because ‘sport’ as singular would sound odd next to ‘cars’ plural, and ‘sport science’, again I guess because science is singular. I first heard some one talk about “playing sport” in Australia in 1967, and then thought, What a silly expression! Now you hear it in England. Except for “sports day” (athletics) we never spoke of sport or sports at school, only of games. Otherwise sports were what people did with guns or fishing rods or hounds. I have noticed during the last few years that adjectives relating to a country when applied to a sportsperson, for example “Portuguese football legend Eusebio”, now are always written as “Portugal football legend Eusebio”. I would be interested to know which is correct. “Portuguese football player” means that he’s a football player from Portugal. “Portugal football player” usually means he plays for the Portuguese national team.